Scaffold Towers – BoSS mobile aluminium towers are light-weight scaffold towers used throughout the building and construction industry for both indoor and outdoor access solutions where a stable and secure platform is required. 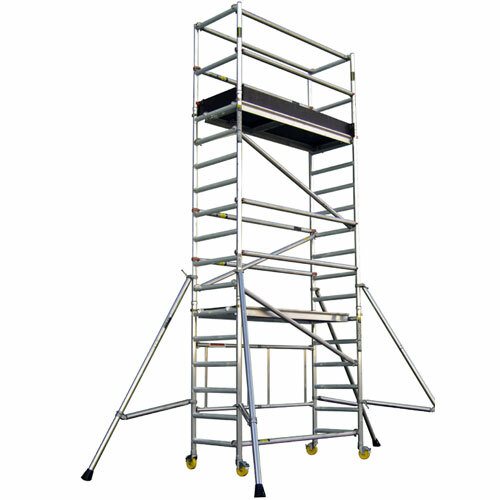 Ideal for maintenance and installation work or short-term access, the highly versatile towers provide a strong working platform for a variety of heights. We stock a range of 2m to 8m Scaffold Towers. Contact us today for long / short term hire rates. Check that all components are on site, undamaged and that they are functioning correctly – (refer to Checklist and Quantity Schedules). Damaged or incorrect components shall not be used. Make sure the ground on which the mobile access tower is to be erected and moved is capable of supporting the tower. The safe working load is 275 kgs (606lbs), per platform level, uniformly distributed up to a maximum of 950kgs (2100lbs), per tower (including self weight). Towers must always be climbed from the inside using the built in ladder during assembly and use. It is recommended that towers should be tied to a solid structure when left unattended. Adjustable legs should only be used for levelling. particularly overhead, plus wires or moving parts of machinery. Before use, check the tower is still correct and complete.